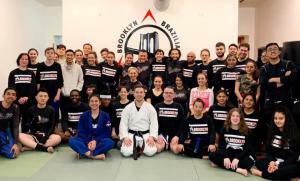 BROOKLYN, NY, UNITED STATES, April 16, 2019 /EINPresswire.com/ -- Maintaining its long-standing tradition of local and national charity support, Brooklyn Brazilian Jiu-Jitsu, Brooklyn’s premier network of collaborative martial arts schools, brought students and instructors together to raise awareness and funds for the Wounded Warrior Project. Sensei Daniel Declet says, “Our work is about teaching people ways to live healthier lives, mentally, physically and emotionally, and WWP is fulfilling a likeminded mission.” It’s a natural fit, Declet continues, because mental and emotional fitness is at the forefront of BBJJ’s mission. The Brooklyn martial arts schools focus on the health and well-being of adults and children in five neighborhoods - Bensonhurst, Cobble Hill, Clinton Hill, Dyker Heights and Gravesend. But its charity work extends beyond those neighborhoods.